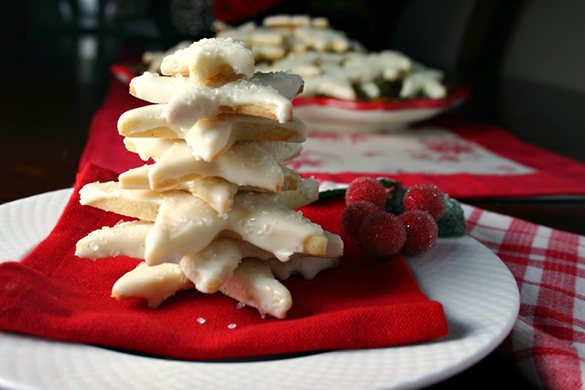 We’ve been working with some extraordinary home cooks this year: a batch of cookie-loving food bloggers from all over North America whom we met in the Food Blogger Cookie Swap. For them, every day is like two weeks before Christmas, that magic aroma wafting through the house, barely controlled mayhem in the kitchen. We thought you might appreciate a few crumbs of their cookie-baking wisdom and experience as we head into the holiday home stretch. Our baking/blogging brain trust knows a thing or two about quality. Before they post, they test, test, test to make sure their recipes are accurate, doable, and yield a product that matches the photo. So we asked them about scaling up a recipe for a photo shoot, a big order, or a crowd. Us: You just double or triple it, right? Chris at Joybilee Farm bases her batches on a pound of butter, and adds one extra egg yolk for each additional pound used. She also suggests reducing the amount of flour by half a cup for every 4 additional cups used and, if mixing dough with a machine, folding in any nuts, fruit or chocolate chips by hand with a spatula and using a bowl scraper to get every bit of a sticky cookie dough. KitchenAid mixers get a lot of love in this group for the hands-free mixing and big bowl capacity. So do cookie scoops and high-quality cookie sheets (as opposed to jellyroll pans; we line out the difference here). Nikki at Nik Snacks suggests coating your scoop with nonstick spray before doling out the dough. “I’m lucky to have two ovens,” says Wendy at The Monday Box. Except for her cutout cookies, she freezes dough in balls that go straight onto the sheet and into the oven. Both she and Shari at Pure Grace Farms prefer to bake one sheet at a time . “Perhaps I’m a bit particular,” says Shari, “but I don’t want to overload my oven.” Before sliding in a second sheet, Sheila at Life, Love and Good Food sets her oven to its “convection bake” setting. Joybilee Farm blog’s Chris notes that sugar caramelizes at 356 degrees F. “Turn up the oven temperature just a bit and you’ll be rewarded with that special golden-brown color and butterscotch flavor,” she recommends. 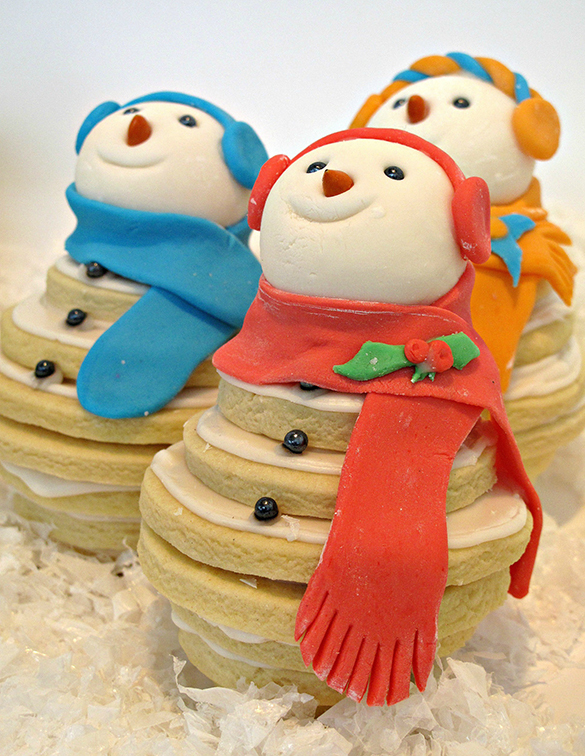 Our cookie advisors tell us they are inspired by their senses and their sentiments in equal measure. When we said, “cookie,” they said, “memories and love.” And, “warm gooey chocolate.” Kathie at Homespun Seasonal Living said, “yum.” They tell us their biggest frustrations come from 1. the clock, 2. the kids, and 3. that one hateful baking sheet everyone has that bakes unevenly and ruins everything. In these ways, they’re just like the rest of us. In other ways, not so much. When the butter is out of the fridge, these bloggers already know what to bake. We mortals, on the other hand, can get overwhelmed by the sheer variety of bars, balls, and biscuits calling to us through the Internet, cookbooks, and memories of holidays past. Sometimes our eyes get too big for our skill sets. There are Pinterest fails. And there is overbaking, underheating, overcrowding, undercooling, failure to measure, and wanton substitution. Still, according to our cookie pros, most common mistakes can be prevented by sticking to directions. Follow. The. Recipe. Preheat the oven. Set the timer. When that first whiff of baking hits your nostrils, check the cookies; they’re probably close to done. Let the cookies cool for a few minutes on the cookie sheet first, then remove them and let them finish cooling on a wire rack. Let the cookie sheets cool between batches. 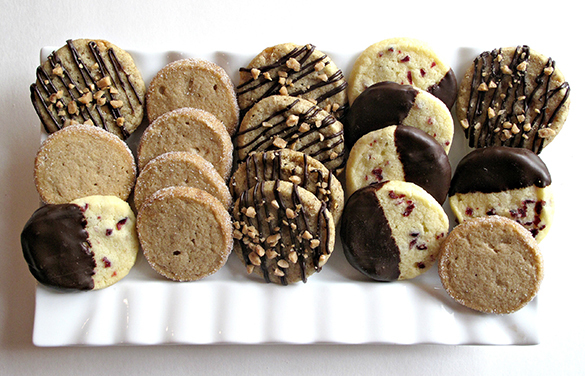 “A warm cookie sheet can cause your cookies to spread,” says Shari at Pure Grace Farms. Making cookies not only delicious and original, but also uniform in size, easy to handle, and fresh is only half the challenge of holiday cookie giving. 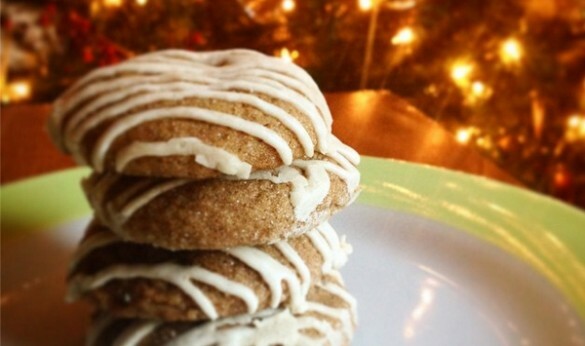 Our cookie-swapping bloggers can also tell us a thing or two about getting them where they need to go. In the food writer’s kitchen, attracting and keeping readers is every bit as important as pleasing eaters. Our cookie-baking bloggers pay extra attention to describing and photographing food, but also to literal packaging. To make sure cookies arrive at their destination fresh and whole, start with an appropriate recipe, suggests Chris at Joybilee Farm Blog, and make sure they’re completely cool before packaging them. Drop, refrigerator, and rolled cookies travel better than bar cookies or cookies that need to be kept cold, and biscotti travel best of all. As we wrap up our own holiday baking, we’re grateful to Food Blogger Cookie Swap organizers Julie at The Little Kitchen and Lindsay at Love and Olive Oil. And to Kathie at Homespun Seasonal Living, Tessa at Homestead Lady, Chris at Joybilee Farm, Wendy at The Monday Box, Nikki at Nik Snacks, Shari at Pure Grace Farms, Angi at Schneiderpeeps, and Sheila at Life, Love and Good Food for generously sharing their kitchen smarts—and their cookies!—this year. Here’s to a perfectly delicious holiday and a splendid 2015! Pls send a carton or two of the lo-fat variety my way.